I'll state it right up front: I know Heather and Jonathan (the authors) very well. I am not objective. I like them. I like their book. I spend a fair amount of time talking to art students about what it takes to be an artist or how to make it in the world as an artist. I think of artists as non-profit organizations. Like it or not, an artist must run a business that for most won't turn a profit but that adds value to either their lives or the lives of others. Rather than subject an artist to my own personal opinions, I now have a place to send artists to get answers and anecdotes on the business of being an artist. Heather and Jonathan not only share their experiences and expertise, but the book is chock full of quotes from all walks of life within the art world. Every single topic on running your own business is covered in here: submission do's and don't's, websites, studio visits, residencies and grants, rejection, crating and shipping work, consignments, gallery relationships, and more. I recommend this book so strongly that if there is an artist out there who can't afford this book ($16.95) I'm willing to buy it for them. No joke. Yes, it has been out for almost a year, but I am getting tired of being reprimanded over and over again for not posting about it here. So, here it is. It is called The Art of Buying Art: An Insider's Guide to Collecting Contemporary Art and it was published by HarperCollins. 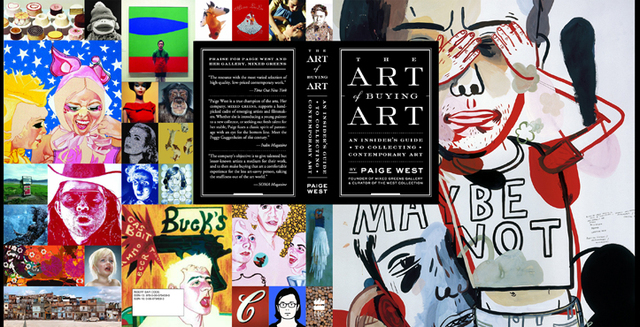 It is a guidebook of sorts for people interested in collecting contemporary art. It is entirely based on my own personal experiences collecitng art for myself and others. It has a lot of pictures of art. Some of my favorites. If you have already purchased the book, thank you! If you'd like a signed copy (and promise to buy one for a friend), send me an email with your address and I'll send you one. Really.